I read this article and found it very interesting, thought it might be something for you. The article is called Demonetisation: A Year On, Onion Farmers In Cash Crisis As Banking System Fails To Cope and is located at https://archive.indiaspend.com/cover-story/demonetisation-a-year-on-onion-farmers-in-cash-crisis-as-banking-system-fails-to-cope-41397. Vijay Nikam, an onion farmer from Maharashtra’s Nashik district, does not have a smartphone, has not heard of netbanking and the ATMs in the nearest town are always out of cash. He had no money for Diwali. One year after demonetisation, IndiaSpend revisited India’s onion bowl to find an economy in crisis. Valwadi/Lasalgaon/Pimpalgaon, Nashik (Maharashtra): A year after the government replaced high-denomination currency notes with an aim to encourage a cashless economy, onion farmers in Nashik, India’s onion bowl, are finding themselves without money to make essential purchases. Government prodding has ensured that middlemen pay them by cheque, but banking facilities are so few and cheques move so slowly between branches that they take weeks to encash. Since the rural economy still runs largely on cash, farmers without cash are unable to buy seeds and equipment and to pay labourers–which can be disastrous if it delays crop sowing–forcing them to turn to private moneylenders, who charge high interests. Six weeks after the government removed 86% of currency from the economy on November 9, 2016, IndiaSpend had reported its immediate impact on onion farmers in Nashik, who had complained of inadequate banking facilities, poor internet connectivity and slow cheque clearance. A year on, we revisited Nashik to see how demonetisation has affected farmers’ lives, and found them no closer to participating in a cashless economy. The Agricultural Produce Market Committee (APMC) in Lasalgaon in Nashik district is Asia’s largest onion market, which handles 15% of the onion crop produced in India. A week after Diwali, IndiaSpend found the mood there gloomy. Some farmers were gathered around a few lone trees, watching tractors tip produce onto the ground, as traders decided what price to pay. “The crop which was priced at Rs 3,250 three days ago is now at Rs 2,000 to 1,800 per quintal [100 kg],” Ashok Kadam, a farmer in his 50s, told IndiaSpend to explain why farmers appeared downbeat. Yet low prices are not their only worry. Since demonetisation, farmers selling their produce at mandis (agricultural marketplaces) such as this one are being paid by cheque. But cheques take anywhere between four and six weeks to encash, Kadam said, explaining that after he deposits a cheque at a bank branch in his village, Maygavdevi Damori in Kopargoan block in Ahmednagar district, it takes a week to reach a bigger branch and then another week or two to get processed there. 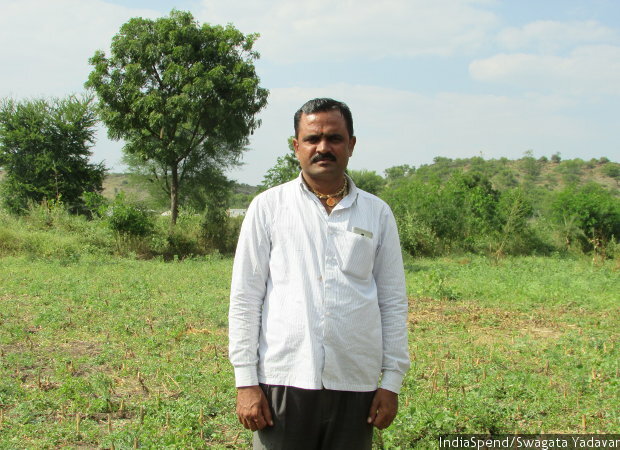 “Farmers sell onion when they are in desperate need for money,” Kadam explained. Unlike some tubers, the white onion can be stored for between four and six months, and sold when a farmer needs money, whether to plant the next crop, settle bills from the previous one, or meet medical or household expenses. Until November 8, 2016, farmers would receive cash immediately on selling produce. “But now we are not getting cash when we need it most, forcing us to take loans and pay interest,” Kadam said. Notebandi, as demonetisation is colloquially known, did not impact him directly because he did not have much cash, but now cheques are putting him under debt, he emphasised. “I have no option but to keep my wife’s jewellery as collateral and take a loan to travel to sell my produce. Once the payment gets deposited in my account, I repay the moneylender,” another onion farmer, Bhikaji Gavare from Sheuge village in Yeola block, told IndiaSpend, adding that he is forced to borrow each time he needs money. “Farmers have repeatedly demanded that mandis switch back to cash transactions, but there has been strong resistance from traders,” said Ashok Gaikwad, an accountant at the Lasalgaon Agricultural Produce Market Committee, Asia’s largest onion market. 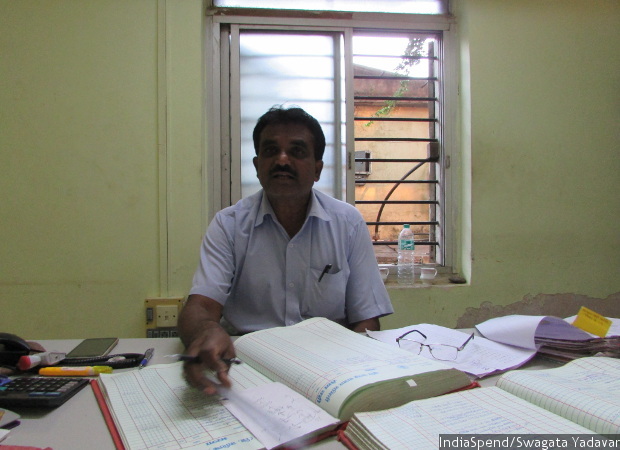 Farmers have repeatedly demanded that mandis switch back to cash transactions, but there has been strong resistance from traders, said Ashok Gaikwad, an accountant at Lasalgaon APMC. Earlier this year, when the APMC asked traders to pay in cash or by RTGS (real time gross settlement), traders went on strike, he said, explaining that the slow processing time for cheques gives traders a newfound leeway, which they do not want to lose. Many traders issue post-dated cheques to further delay payments, Gaikwad said, adding that many farmers have complained against bounced cheques at the APMC. Traders would pay in cash if the APMC passed a resolution, Sushant Bhandare, another onion trader who sells at the Lasalgaon and Pimpalgaon APMCs, said. The Pimpalgaon and Chandwad APMCs are continuing to pay farmers in cash. A cashless economy requires an entire ecosystem, which the village still lacks a year after IndiaSpend last visited–there is still no Internet access; and the closest ATM is still 25 km away, the closest nationalised bank 15 km away, and the district cooperative bank 10 km away. Most villagers here do not own a smartphone–1 billion people across India do not–so they cannot access mobile banking services or internet-based payment systems. Meanwhile, traders are facing mounting pressure from the government. In September, the income tax department raided godowns of seven big onion traders in Nashik, soon after a delegation from the central ministry of consumer affairs visited Lasalgaon to ascertain the reasons for a massive fluctuation in onion prices at the APMCs. Onion prices had soared in August, a rise partly attributed to 30%-40% less production in Karnataka due to poor rains, and partly to cartelisation by traders, which the federal agriculture ministry had asked the Maharashtra government to check. The resulting raids halted auctions for a few days, and prices crashed by 35%. In October, traders were asked not to store onions for more than four days, further affecting trade. 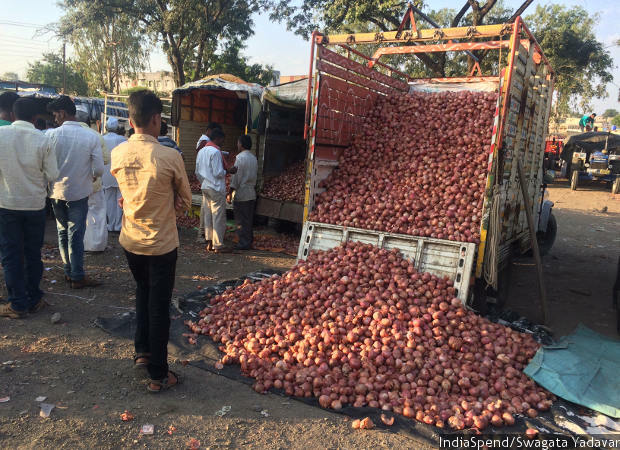 Trucks unload onions at the Pimpalgaon Agricultural Produce Market Committee (APMC) in Nashik, one of the few APMC markets that pay farmers in cash. Farmers prefer to accept a lower rate for a cash payment, instead of accepting cheques that take weeks to encash and often bounce. “We have reduced our purchase from 5,000 quintal per day to 500 quintal per day,” Bhandare said, adding that it is difficult to unload, sort and transport large consignments in four days because the work is dependent on labour supply and fewer labourers are available for work since Diwali. As a result, traders are buying at least 50% less than usual, Sanjay Agarwal, an onion trader at Chandwad APMC, told IndiaSpend. “Traders are not willing to buy more than they can sell,” he said, adding that this is the first time in his 25 years as an agent that such stock-keeping curbs have been imposed. The efforts to keep prices low are aimed at keeping the urban consumer happy, but hurt farmers. “Since this government sees the urban electorate as its core voter base, it is committed to keep them happy at the cost of farmers,” Giridhar Patil, an agricultural expert from Nashik, said. “Even (a) loan waiver is being delayed indefinitely, it was expected to be disbursed from October 31 but last heard, loan waiver documents were ‘under scrutiny’,” he added. Experts said farmers are not getting the minimum support price for moong (green gram), urad dal (black gram) and soyabean, rendering them unable to recover their investment. And then there are efforts to control prices of farm produce such as onions. “Won’t this push farmers out of farming?” Vaijnath Bhonsale, an activist farmer from Beed district in Maharashtra, said. In Madhya Pradesh, too, farmers are angry at not being paid in cash and the government has intervened to ask traders to make cash payments for amounts of upto Rs 50,000. Vijay Nikam, an onion farmer from Dabhadi village in Malegaon taluka of Nashik, said he does not have a smartphone, has not heard of netbanking and the ATMs in the nearest town are always out of cash. IndiaSpend met him at the Pimpalgaon APMC, another large onion market, 70 km from his village. Although there are other markets closer by, he prefers to go to Pimpalgaon because traders there pay in cash. “I had no money for Diwali because of cheque transactions,” he said, adding that he prefers to sell cheap if the payment is in cash because it pays for his transportation, at the very least. Valwadi is a small village of 1,500 people in Malegaon, Nashik. Located 295 km from Mumbai and 123 km from the district capital, it does not figure on Google Maps. Perpetually short of water, Valwadi’s wells go dry by January each year, just months after the previous year’s monsoon. Women ferry water from the only well that is the village’s source of drinking water. Half the houses lie abandoned as their owners have moved to live on farms downhill, where there is more water. By government definition, Deepak Patil, 37, who owns 40 acres of land, is a large farmer–one among India’s 0.70% large cultivators. Even though he grows corn, onion and tur, he is a worried man. Deepak Patil, 37, who owns 40 acres of land in Valwadi village in Nashik, is one of many farmers who find themselves in a bind due to the government’s push towards a cashless economy. He owns a smartphone but his village has no Internet connectivity to enable online transactions. The closest ATM is 25 km away and the closest bank 10 km away. Banks take weeks to process the cheques that farmers receive for selling their produce. Patil employs 20 labourers, each of whom has to be paid Rs 250 per day. 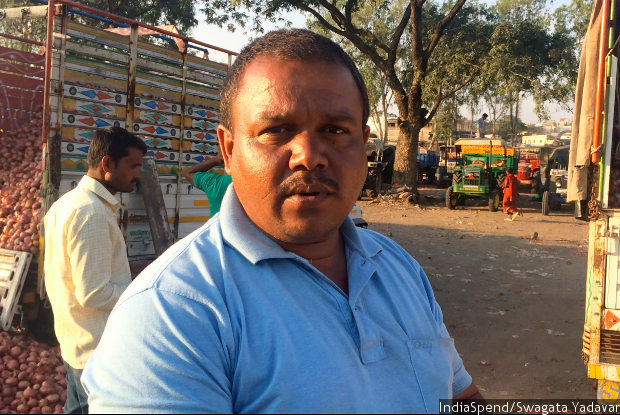 “We spend Rs 1 lakh for 2 acres of land which produce 200 kg of onion,” he told IndiaSpend. Due to low prices and poor rainfall, he earned only Rs 50,000 last season, leaving him unable to pay instalments for a Rs 17 lakh loan he had taken two years ago. In all, he said, his losses over the last three years amount to Rs 4 to 5 lakh each year. With such poor returns, farmers are losing their faith in farming, he said, adding that he has bought a kirana (grocery) shop in Vadner, a town nearest to the main road, as a backup. “I get calls from the bank asking for loan repayment several times every month. They talk about auctioning my land and shop,” Patil said. Before demonetisation, most farmers relied on district cooperative banks (DCCBs), and many did not have accounts in other banks. During demonetisation, the Reserve Bank of India prohibited DCCBs from exchanging defunct notes for newly minted ones. In November 2016, DCCBs in Maharashtra had Rs 2,240 crore in old currency notes, and were allowed to exchange these for new notes only in July 2017. When Maharashtra announced a loan waiver on agricultural credit of up to Rs 1.5 lakh in June 2017, farmers stopped repaying their debts and the cash reserve with DCCBs dwindled further, stalling their functioning. Onion farmers say they now have to visit nationalised banks, which they are unfamiliar with and where the staff are unhelpful. “Nationalised banks have never cared to cater to farmers,” Nikam said. “Not even the peon in a nationalised bank helps an illiterate farmer fill the cheque slip,” Gavare added.